By now, a lot of you know about the abandoned brick-arched train tunnel underneath Atlantic Avenue in Brooklyn. But I’m guessing far fewer of you are aware of the caves honeycombing what the geologists call the “Heartland Formation” “Ravenswood Granodiorite” under Brooklyn Heights. I had a rare opportunity to go there recently with the Brooklyn Spelunkers, an organization of some secretiveness because of their often illegal activities. I was sworn to silence about their identities. (Mostly women in ninja outfits, they all insisted on being called Caver One, Caver Two, etc. Whatever.) We descended past the old Underground Railroad station beneath Plymouth Church and the Dutch-era salt mine shafts to take a look at the pre-Columbian wall paintings found at the lowest levels of the great cave system. Although Caver-Five or maybe it was Six hissed “No photos!” I did manage to get this image of the extinct North American Dire Ox, Bos brooklynensis, on the strangely smooth wall of the cave. I’m not alone in judging this one of the finest examples of pre-Woodlands Culture art in the continent. Although there’s no sense of scale on this forceful drawing, which itself is just about eight inches across, we know from other archeological evidence that Dire Ox legs were as long as seven feet, meaning a family of humans could easily fit underneath this lowering beast. Amazing! But where are they now? Gone, gone, gone, killed off by the the same climate/hunting economy confluence that took out the rest of North American megafauna. The last Dire Ox was seen in this region some 9,000 years ago. Long time passing. Sad the way our magnificent wildlife has been killed off by unthinking humans, even in prehistorical times. From the research I’ve done, I’ve learned that because this impressive species was wiped out, both dire wolves and sabertooth tigers were forced to make do with much smaller prey. With insufficient nutrition, both predator species soon followed the dire ox into extinction. Dire indeed. 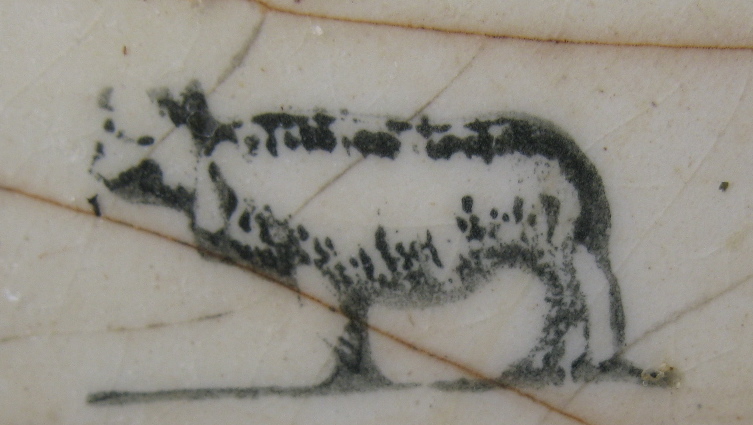 Luckily, some Italian ceramic painter sometime in the 20th century decided to commemorate this fabled ox on the bottom of a piece of china, but this scrap was all that remained. This one had its moments, too. The salt mines and old Underground RR tunnels remain under-explored. I always enjoy your posts but today’s are a real treat! Thanks, Ann, it’s the first of April all day today.